As Clare Kelly wove the colorful yarn around the circular, plastic loom, she explained what she was doing. Clare was making the hat in the service section of Camp Tekakwitha, the thematic park at the National Catholic Youth Conference (NCYC) held at the Indiana Convention Center in Indianapolis on Nov. 19-21. The service area was designed to engage youths in an important aspect of being Catholic—serving others, an aspect Clare seemed to already understand. Aaron Frazita, a member of the thematic park committee, explained more about the role of service at NCYC. To accomplish that, the service section offered information and hands-on activities at nearly 10 stations, like the hat-knitting area. Beggars for the Poor, a volunteer-run ministry that helps the homeless in Indianapolis, will give the knitted hats to those whom they serve. On the other side of the service section, youths sat at tables writing messages and making designs on T-shirts and tote bags for Haitians. “We’ll be sending these T-shirts and tote bags to our sister parishes in Haiti when all this is finished,” said Father Thomas Clegg, pastor of St. John Paul II Parish in Clark County. Mariah Brown of the Archdiocese of Kansas City, Kan., was excited about the opportunity to make an item to send to Haiti. In another section of Camp Tekakwitha, Catholic Relief Services (CRS) operated food package preparation stations as part of their Helping Hands Program. “It’s a program where participants come together to package meals to send to our hungry brothers and sisters in Burkina Faso, which is a country in West Africa,” said Rachel Malinowski, a program relief officer for CRS. Each pouch of food makes from 6-8 meals, Malinowski said. 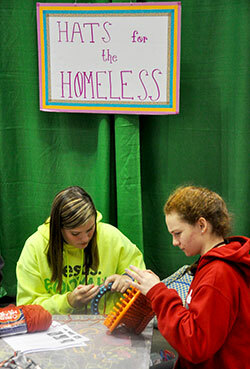 During NCYC, 50,000 pouches were completed. Participants learn not just about the project to feed the hungry in Burkina Faso. They also learn about other Helping Hands programs. Emma Wagner of the Diocese of Savannah, Ga., participated in the Helping Hands project, filling pouches with food. Bishop Emeritus John Kevin Boland of the Diocese of Savanah, stood across from Emma as he helped fill the food pouches. He looked around at all the youths busy at the Helping Hands stations, and beamed with pride.